First let us thank you, in the name of the International Sol-Gel Society for your support during these past few years, wether it was through your direct subscription or through your participation to one of the ISGS events such as Sol-Gel 2009 in Brazil or one of the ISGS summer schools. Substantial DISCOUNT at ISGS events like the summer schools, international sol-gel conference in 2011 in China and pre conference workshops. 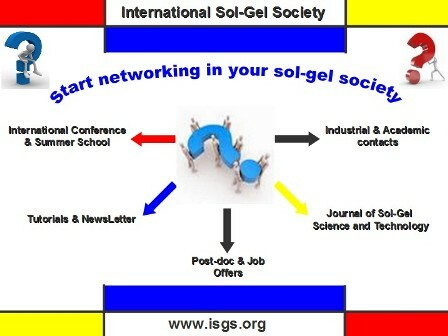 But more, importantly you will support the effort of the ISGS to promote excellence in the field of sol-gel technology by the organisation of awards such as the Ulrich Award from early career researchers or the best posters award at the sol-gel Workshop. You will promote the exchange of ideas through the organisation of our well-established sol-gel conference every two years. You will provide students with scholarship to attend key meeting and summer school like the 3 recipients of the John D Mackenzie Travel award. You will enable key links between industrial users and key academics in the fields. So please renew your membership NOW through the website by log in the members area and opening the page “your options”. The ISGS Board of Directors. (If you are not yet registered in our network, you can register here https://www.isgs.org/index.php/component/user/register).